A painter, sculptor, and architect, Cano trained under the prominent teacher Francisco Pacheco in Seville, the home of Spain's most important Baroque painters. Like his fellow student Diego Velázquez, who rose to become the great master of this age, Cano was called to Madrid to work at the court of Philip IV. This painting, probably completed shortly before Cano's move to Madrid, once hung in the Colegio de San Alberto in Seville. 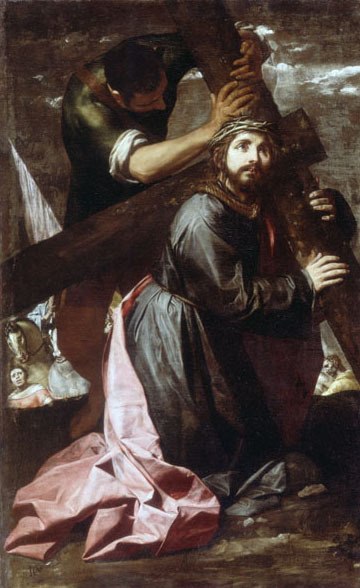 The subject of Christ carrying the cross was a popular one in Spain and even today is often acted out as part of religious ritual. Cano drew attention to the suffering Christ through realistic details like the rope around his neck, the crown of thorns on his head, and his blood-stained brow. The realism is heightened by strong contrasts of light and shadow, a technique that ultimately derives from the influential Italian Baroque master Caravaggio. These dramatic effects were favored by many artists of the Counter Reformation, who used them to engage the viewer in their subjects.